Managing a loved one’s drug or alcohol addiction is never easy, but those whose spouse has a substance use disorder (SUD) face an especially tough and lonely road. For one thing, the painful and often traumatic relational fallout due to an addiction is compounded by the greater likelihood of divorce, which is itself ranked as the second most stressful life event anyone can experience. When the addict’s partner is knee-deep in navigating their spouse’s substance abuse, confiding in their own parents, in-laws, children, or relatives may not seem a safe or healthy option, leaving them with a grave sense of loneliness. So much of their energy is directed at helping their spouse to recover that their own needs and emotional wounds often get neglected. As a therapist who has worked with the partners of addicts, I’ve quickly learned that handling the situation with empathy, acceptance, and patience isn’t just a helpful way to support a spouse with an addiction – it’s also a healthy strategy for one’s own self-care. So how, as a spouse, do you take this more empathic approach when the natural tendency is to react in anger and point fingers or to shoulder more than one’s fair share of responsibility for the problem and its solution? Below are three guidelines. Attributing what’s a diagnosable disease that can benefit from treatment to an inherent character or personality flaw in your spouse can get in the way of the healing and recovery process. It assumes that positive change is virtually impossible. Similarly, absorbing your spouse’s addiction in terms of what it negatively says about you can also prove of no utility when you’re working on building a supportive relationship. If you can, then, do your best to separate your spouse from their problem, and then try to work together on a solution to the problem. Empathy, acceptance, and patience are a good rule of thumb, so long as you’re not constantly bending over backwards to accommodate your spouse’s needs. If you find yourself getting rundown by endless self-sacrifice, make a list of what you will and will not do in an effort to be empathic and supportive. Then stick to it with the understanding that you can always tweak the list as you go along. Giving yourself permission to have healthy boundaries is itself a way to support your spouse in their recovery. “You” statements tend to put most people in a defensive mode. The same dynamic pertains only more so to those shielding an addiction. Instead, try to access what you are feeling in response to your partner’s behaviors, and then speak from that first-person place of emotion in response to concrete experiences. While unfortunately there’s no guarantee that your partner will hear you as drugs and alcohol blunt a spouse’s capacity for empathy, these sorts of statements will be more likely to elicit emotional connection than others. And that mutual empathy (the emphasis being on the “mutual”) will be a critical building block in both your recovery, your spouse’s recovery, and your relationship’s recovery. Candice Rasa, LCSW, is Clinical Director of the Beach House Center for Recovery, a drug and alcohol addiction rehabilitation center in Juno Beach, Florida. She has over 10 years experience in the mental health and substance abuse arena. If you’d like help deepening your understanding of how recovery and wellness fit into your lives or in your practice. 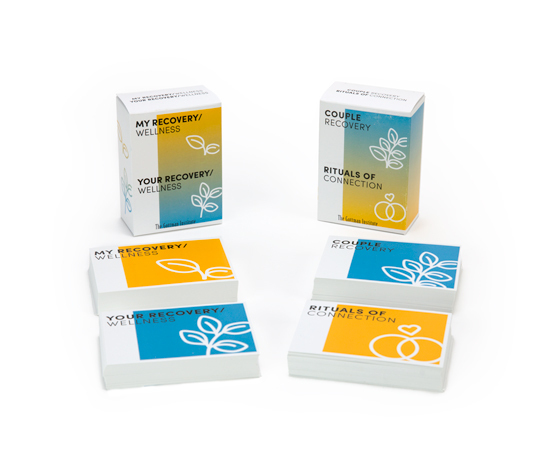 Use these card decks to identify successes, discuss challenges, and build new rituals of connection. If you are a professional who works with couples affected by addiction, you may benefit from attending Couples and Addiction Recovery, a one-day training presented by addiction specialist Dr. Bob Navarra.